Drugged Driving: Is It Placing Lives at Risk? Turning Accidents: Who is at Fault? Enter your location to find a car accident attorney close to you. See local car accident attorneys in your area. Learn about the different types of car accident claims in Michigan. Houston car accident lawyer discusses what needs to be handled after a car accident. Attorney Gerry Marcus has handled thousands of personal injury cases involving car accidents. The importance of hiring a lawyer after a truck accident case. Helpful tips about what to do after you have been involved in an accident. If you've been injured in a car accident, you may be considering whether to work with a local attorney to handle your insurance claim or lawsuit. The truth of the matter is this: though you can try to handle your claim yourself, the insurance company may try to delay payment or may offer you a settlement that simply does not cover all of your post-accident expenses and losses. Some insurance providers may even try to deny a valid claim. In the face of dishonest, deceptive and outright illegal practices by insurers, you may benefit from having a competent legal professional to stand up for your rights. With the right approach and the resources to properly handle your case, an attorney may be able to help you recover maximum compensation for all of your medical expenses, lost earnings, property damage and any other losses or expenses you are dealing with. This can make all the difference in your ability to move on with your life and build a secure financial future. This directory was created to help victims and families of victims of auto accidents throughout the U.S. find attorneys who can help with their claims. With a simple click of a button, you will be provided with a list of lawyers who handle car accident cases in your area. You can then compare law firms based on whatever issues may be important to you, such as experience, case results and education. You can visit their websites and can also call them to talk about your particular questions and concerns. When you have the right lawyer to handle your case, you can achieve much-needed peace of mind and a positive result that helps you provide for yourself and your family. Use our directory to find a car accident attorney today! Have you suffered injuries due to the reckless actions of another person? Are you facing debilitating injuries and serious property damages from the accident? 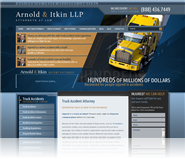 At Arnold & Itkin LLP, the legal team provides unparalleled representation to trucking accident victims nationwide. They have recovered hundreds of millions of dollars for injury victims in the past and have successfully secured over $250 million alone in the year 2011. From accidents involving big rigs and tractor trailers to those with a drunk driver at the wheel, you can rely on this team to bring you the aggressive, competent legal advocacy that you deserve. Despite the type of injury you have acquired as a result of this negligent individual's actions, you can get the help you need by contacting a truck accident attorney form Arnold & Itkin LLP. They provide individuals and families with a free, no-obligation consultation regarding their truck accident. It is important that you act quickly after being involved in this type of accident – evidence and witnesses begin to lose their legitimacy after some time. Furthermore, truckers may not have the log from the day that the accident occurred or from the moments leading up to the accident. In some cases, an accident can be traced back to truck driver fatigue, and only the trucking logbook will prove that a driver operated the vehicle past the mandated hours of operation. Perhaps an employer hired an inexperienced truck driver who failed to understand the laws of the road or never received his or her commercial driver's license. No matter what the case may be, talking to a truck accident attorney is always suggested by this law firm. To learn more about your options to pursue compensation, contact a truck accident lawyer from Arnold & Itkin LLP today. I was waiting at a stop light when a woman rear ended me, can I file an injury lawsuit? My teenage son was killed in a DUI accident, can I sue for wrongful death? I was t-boned when driving through an intersection, can I sue for my injuries? Power, Rogers & Smith, L.L.P. Are You Using Car Seats Correctly? Chicago Car Accident Lawyer, Insurance Is Paying...Do I Need A Lawyer?